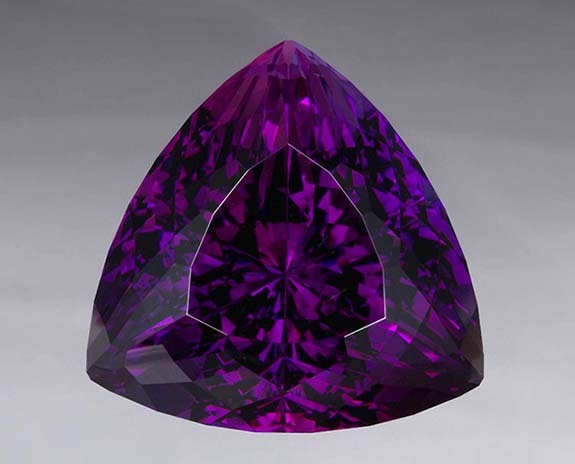 Billed as the first amethyst from Rwanda to join the National Gem Collection, this stunning 78.3-carat Super Trillion Cut was faceted by award-winning cutter John Dyer and is a first-rate example of February’s birthstone. Dyer told us yesterday that the original rough amethyst, which weighed 465.5 carats, yielded four finished stones, the largest of which was purchased by the Smithsonian in 2017. The second-largest weighed about 10 carats. The painstaking faceting process took more than three days to complete. Smithsonian representatives were impressed by the stone’s size, unusual origin, unique cut and deep rich purple color with flashes of red. Based in Edina, Minn., Dyer has notched 54 cutting awards and is famous for his artistic ability and passion for precision. His Super Trillion Cut reflects an optimized pattern that adds more facets and other variations to the traditional trillion cut. Dyer noted that he purchased the rough amethyst through a dealer who had access to a brand new find in Rwanda. Amethysts traditionally have been sourced in Brazil, Uruguay, Zambia, Mexico, Italy, Germany, Canada and the U.S.
Amethyst is the most coveted variety of quartz, which is clear in its pure state. Amethyst gets its purple color from a few atoms of iron displacing some of the silicon in the gem’s molecular structure. These traces of iron can give amethyst a wide range of colors, from almost white to deep purple. The ancient Greeks believed amethyst could prevent drunkenness. Medieval soldiers wore amethyst to protect themselves in battle. Other cultures believed February’s birthstone would bring good fortune, inspire their intellect, heal their illnesses, or bolster their immune systems. Amethyst gets its name from the Greek word “amethystos,” which literally means “not to intoxicate.” Apparently, the Greeks believed amethyst could reverse the effects of drunkenness. Other characteristics attributed to amethyst include peace, balance, courage, stability and inner strength. The color rating of an amethyst is determined by its hue, tone and saturation. Hue is the color; tone is relative lightness or darkness of the color; and saturation relates to the color’s intensity, from dull to vivid. Credit: Photo by John Dyer & Co, courtesy of the Smithsonian.